A total of 3,832 original notifications were reported to the European Commission last year. Of these, 942 were classed as alerts, 596 as information for follow-up, 706 as information for attention, and 1,588 as border rejection notifications. The original notifications gave rise to 9,117 follow-up notifications. Compared to 2016, the number of alert notifications, indicating a serious health risk of a product on the market, rose by 11 percent with 24 percent more follow-ups transmitted, according to RASFF. Overall figures present a 28 percent increase in original notifications compared to the 2,993 in 2016 and a 25 percent rise in follow-up notifications. Read the full report here. The fipronil incident resulted in the most intensive exchange of information in the history of RASFF. Salmonella in poultry meat was the most frequently reported issue in food checked at the EU border. Vytenis Andriukaitis, European Commissioner for Health and Food Safety, said the alert system helps ensure that food put on the EU market is safe, can be traced, and quickly removed from shelves if needed. “[The] fipronil incident has led us to propose ways to further strengthen the system, making it more equipped to fight against fraud through coordinated actions by food operators and member states’ authorities in this area. Most of the improvements and concrete measures that member states committed to are well on the way,” he said. One incident involving the United States related to vegetable extracts from the country used to inject tuna from Spain. This was probably to achieve a color fixation of tuna to make it bright red but such treatment is not authorized. Netherlands topped the list of notifying countries with 162 for Salmonella in poultry meat products. Italy made 98 notifications for mercury in fish products and Netherlands was third with 82 alerts for aflatoxins in nut products and seeds. A total of 69 notifications came from Italy concerning fipronil in egg products. Italy topped the total list of original notifications by notifying country with 551, followed by Netherlands with 491, Germany with 385 and the United Kingdom had 373. The amount of notifications on pathogenic microorganisms in food from non-member countries is higher than mycotoxin issues for the first time in a while due to increased checks on poultry from Brazil. Salmonella in poultry meat products from Brazil led the notifications list by country of origin with 320 alerts. Next was pesticide residues in fruit and vegetables from Turkey with 83 notifications, aflatoxins in nut products and seeds from China with 81 notifications and unauthorized novel food ingredient in dietetic food, food supplements or fortified foods from the United States also featured in the top 10 list with 77 notifications. There were 372 notifications that listed Brazil as the country as origin, compared to 56 in 2016, Turkey was listed 316 times, 303 had China as country of origin, Spain for 232 notifications and the United States had 195. There was an 18 percent increase in notifications on pathogenic microorganisms in 2017 compared to 2016. Salmonella is the most frequently reported pathogen in food from member countries with 207 notifications, up 22 percent, and for non-member countries with 471 notifications. 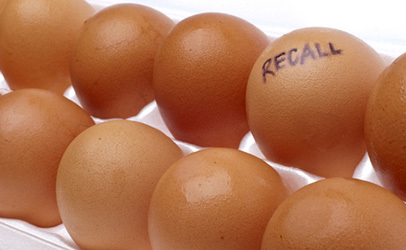 Meat is the bulk of these but egg products with Salmonella Enteritidis also feature heavily. There were 43 notifications on Salmonella in poultry products from Poland, most often (28 notifications) concerning Salmonella Enteritidis in fresh poultry. Fish (smoked salmon) was most frequently notified for Listeria monocytogenes contamination. However, France is the most frequently notified country for this pathogen due to companies’ own checks on cheeses. Products involved are often made from raw milk. The top type of notification for too high count of E. coli is related to the food safety criterion for live bivalve molluscs by France, followed by the UK and Italy. There were 23 notifications concerning norovirus, 10 of which reported it in live oysters from France. There were six notifications in different kinds of berries, mostly strawberries and raspberries. Denmark notified 10 times on the presence of Campylobacter, mostly in fresh chicken. Pesticide residues ranked second in the top 10 hazards for products from member countries mainly due to the illegal use of fipronil as a veterinary medicinal product or biocide and residues in eggs. In total, 719 follow-up notifications to the original RASFF fipronil post were transmitted in 2017, which is more than three times the highest number of follow-ups in any previous incident. Milk, gluten, soya and nuts are the most commonly reported allergens in 114 notifications. Cereals and bakery products are the most often notified. In 10 cases consumers suffered allergic reactions due to presence of an allergen that was not indicated on the label. Aflatoxins dominated the type of mycotoxin most reported in RASFF. Nuts, nut products and seeds grew due to higher numbers of notifications on groundnuts from China and India. The significant increase in notifications on dried figs keeps Turkey at the top as most notified country of origin. Recurrent notices involved U.S. ground nuts with 11 border rejections notifications, and pistachio nuts from the United States with 32 notifications, 26 being border rejections. In 2017, there were 66 notifications identified as triggered by food poisoning. As many as 22 of them could be related to elevated histamine levels in tuna. A total of 25 notices related to pathogenic microorganisms, 10 of which listed salmonellosis. An outbreak of 13 Salmonella Typhimurium cases linked to salami snacks from a Spanish producer was reported by Denmark in October 2017. Denmark found pH values in the salami were not suitable for a meat product stable at room temperature before opening (pH 5.3) as was shown on the labelling, indicating the fermentation process had not been effective. Fermentation is crucial to diminish eventual microbial contamination and should be done in a way as to obtain and maintain a low pH value, preferably below pH 5.3. Another multi-country Listeria outbreak was linked to frozen corn and vegetable mixes processed at a Greenyard freezing plant in Hungary. The producer considered the corn to be a product intended for cooking but it ended up in items that were also consumed raw.